Data Glitch simulates digital glitches and gives you many levels of control to create them. You can create a lot of slick transitions and glitchy effects using the plugin. Glitch Count: The total number of glitches to create in the current image. Scan Type: If the scan type is Image the whole image is ‘glitched’ using one random seed, while the Strip mode splits the image into multiple strips and glitches them with different seed values. Image type works best with footage, where as Strip mode works best with type and other graphic elements. Strip Size: Size of each image strip. (Strip scan mode only). Seed Random: The seed from which random values are derived. Color Space: The color space in which the glitches happen. RGB (Red, Green, Blue) or YUV (Luminance, Chroma-blue, Chroma-red). Compression Quality: The quality of image compression. The lower the quality is, the more glitchy the image looks. Quality Image Map: You can use an optional image map, to set the quality for every pixel. Completely dark pixel implies zero quality, and completely white pixel implies full quality. What is Scan? Scan in video terms, is usually one horizontal line in the image. A glitch in scan means, all the following lines in the image/strip are affected. Scan Glitch: Sets the amount of glitch to happen in the scan. This is multiplied by the Glitch Count parameter for the total scan glitch to happen in that image/strip. Scan Glitch Amplitude: The maximum amplitude of the scan glitch. The higher the value is, the brighter the glitch looks. Apply Scan Glitch To: Apply it to all channels or just an individual color channel (R,G,B or Y,U,V). Per Channel Seed: Use separate random seed for every color channel. Otherwise the seed will remain the same for all channels. Block Glitch: Block Glitch creates tiny blocks of scrambled data at random places in the image/strip. You can also use a custom image map to control where the blocks appear. Block Glitch Amount: Sets the amount of block glitch to happen in the image/strip. This is multiplied by the Glitch Count parameter for the total block glitch in the current image/strip. Block Glitch Amplitude: The maximum amplitude of the block glitch. The higher the value is, the more scrambled the glitch looks. Block Glitch Image Map: Use an optional image map to create block glitch. Apply Block Glitch To: Apply it to all channels or just an individual color channel (R,G,B or Y,U,V). Offset Glitch: Offset Glitch creates glitches by offset the image at random intervals through out the image/strip. 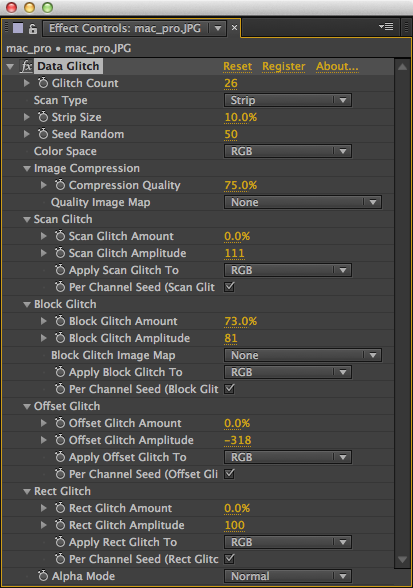 Offset Glitch Amount: Sets the amount of offset glitch to happen in the image/strip. This is multiplied by the Glitch Count parameter for the total offset glitch in the current image/strip. Offset Glitch Amplitude: The maximum amplitude of the offset glitch. The higher the value is, the more scrambled the glitch looks. Apply Offset Glitch To: Apply it to all channels or just an individual color channel (R,G,B or Y,U,V). Rect Glitch: Rect Glitch is a cool way of creating glitches. It creates glitches based on rectangular mapping and works very well with both footage and type. Rect Glitch Amount: Sets the amount of rectangular glitch to happen in the image/strip. This is multiplied by the Glitch Count parameter for the total offset glitch in the current image/strip. Rect Glitch Amplitude: The maximum amplitude of the rect glitch. The higher the value is, the more scrambled the glitch looks. Apply Rect Glitch To: Apply it to all channels or just an individual color channel (R,G,B or Y,U,V). Alpha Mode: Dealing with Alpha channels can be very tricky because most of the real life video glitches happen in a color space without an alpha channel. But, for greater control over the graphics, we’ve included support for alpha channel with three modes. Normal: In Normal mode, each color channel is premultiplied with the alpha channel before the effect is applied and then later on it is unmultiplied. This causes very subtle artifacts when dealing with subpixel transparency like edges of a Text layer. But in most cases, it is not noticeable. Opaque: In this mode, the alpha channel is completely discarded before applying the effect. Force: In this mode the effect is applied without the alpha channel and then the alpha channel is forced on the output after the glitches. It works very well for video/text transitions.